Rental of professional fins and boots in sizes XS, S, M, L, XL, XXL . We have available 5mm and 7mm wetsuits from Scubapro, Beluga and Aquata. We carry overalls and double piece suits as well as shortys. All Suits come with hood. For children we have special kid size suits. For night dives, cavern dives and wreck dives we have LED torches from Sea*Pro available. We carry computer from Scubapro/UWATEC. 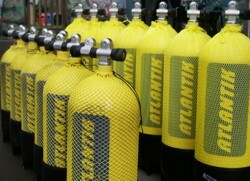 Private equipment can be rinsed and stored in the dive centre. A separate room for private equipment is available, several power connectors (220 V) for chargers can also be found here. During the excursions wallets, keys, mobiles and papers can be stored at the office.